James Byrd, ex-guitarist of Fifth Angel has landed with his new solo album, Anthem. Mr. Byrd was motivated by the events of 9/11 to create this album. However, he did not want to capitalize on 9/11 as a selling point for this album. There is nothing on the cover or otherwise directly referencing these events, and the lyrical references are very indirect. Anthem is a progressive rock album that pays homage to rock and metal sounds of the 70's while managing to sound new and fresh. Certainly Queen and maybe Deep Purple and Rainbow come to mind while listening to this CD. The keyboard layers are thick and always present. There is also a symphonic element to the songs, but not similar in style to bands such as Blind Guardian or Rhapsody. The symphonic elements are somehow secondary in nature; they add to the atmosphere of the songs, but do not transform them into majestic, epic songs as you will find with Rhapsody, Blind Guardian, and others. 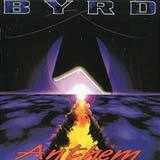 James Byrd delivers a plentiful amount of "virtuoso style" solos throughout the disc, although the guitar work in general is not nearly as flashy or dominant as was the case in Fifth Angel. You won't hear too many driving riffs as the songs depend mainly on the symphonic and keyboard elements as well as James Byrd's deep emotions rooted within each and every song. The album is very well balanced between mid temp and slow songs as you might expect from an album inspired by such a large loss of life. As I said, you won't hear any heavy or aggressive moments, but rather a more subdued and emotional album. Vocalist Michael Flatters rises up to the task of conveying Byrd's deep emotions through his singing. The production is above average, although the drumming could have been just a bit louder to create the perfect balance. Although a very solid and consistent release, I feel that it could have used a slightly heavier guitar sound without sacrificing the emotional impact of the album. This album should appeal most to the prog rock / metal fans out there, although this album has quite a unique sound with its 70's influences mixed in.